If people thought of their grills like they do their stovetops, there would be fewer problems with grills wearing out. Think of it this way, after cooking something on the stove, you generally have to wipe up the spills. Every now and then, depending on how often it gets used, you should do a more thorough cleaning of your grill. This includes moving everything out of the way and wiping around and under the burners. A grill should be treated like the stove. Every time you use it, clean it. Cooking grates are no exception to this general rule. They need to be cleaned completely after every use. This prevents food from sticking on your grill making it much easier to cook on. There are a lot of products on the market for cleaning your grate, but really any good stiff wire brush will do. Now, few people seem to know the best way to perform this little task. First of all, it is better done after you grill and not before. Once your grill has cooled down a bit but is still warm, take your brush and clean off any remaining food particles. It is much easier to clean off food particles while warmth is still present and not after they have cooled and been allowed to harden on the grate. If you have a cast iron grate clean completely, then brush on some oil with a paper towel to keep your grate in proper shape. Bare cast iron needs to be inspected regularly because it is more likely to rust. One of the great things about charcoal grills is that you clean it out after every use. However, many people don't take advantage of the situation and simply dump the ashes out. Keeping a good wire brush handy to sweep out the cooked on remains will make additional cleaning jobs much easier. And don't think that because you have one of those grills with the ash catchers that you don't have to do any cleaning. Everything you cook on requires cleaning. So every time you use your charcoal grill, clean the grate and brush out the ashes and cooked on foods. This will cut down on excess smoke and bad flavors. Periodically, get in there and really scrape out all that stuff that just seems to develop on the bottom of your grill. At least once a year, get out a bucket of soapy water, and give it a really good clean. If you need to touch up the color, get a can of grill-safe paint. The bad thing about many gas grills is that they have a setting on the knobs marked “clean.” Many people are misled into thinking that this is how you clean a grill. Like a charcoal grill, you need to clean your gas grill every time you use it. Make sure that the grates are cleaned after you grill, and brush off the sides and lid after every use. Use the clean setting to preheat your grill. Yes, it will burn up stuff that has fallen down into the grill, but it doesn't really clean it. Regularly you should lift out the cooking grate and clean off the barrier above the burners. This might be lava rock, briquettes, or some variation of metal plates. Regardless of the style, it should be cleaned to remove the cooked-on grease and food particles periodically. With everything out of the grill, clean it completely with soapy water. If the paint is coming off, or if your grill is showing signs of rust then you need to do some painting. Other than that, put everything back in, check to make sure that all connections are good, and then turn it on. 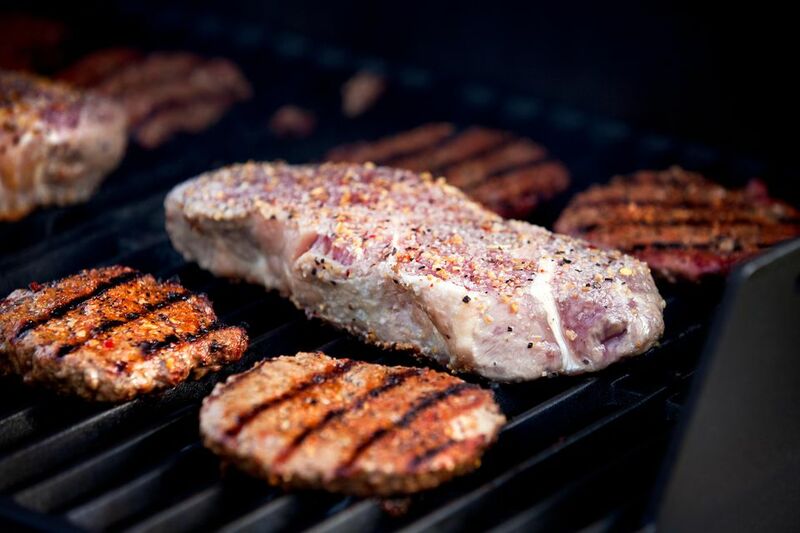 Let the grill heat completely before you cook again to make sure that any leftover soap residue gets burned off. 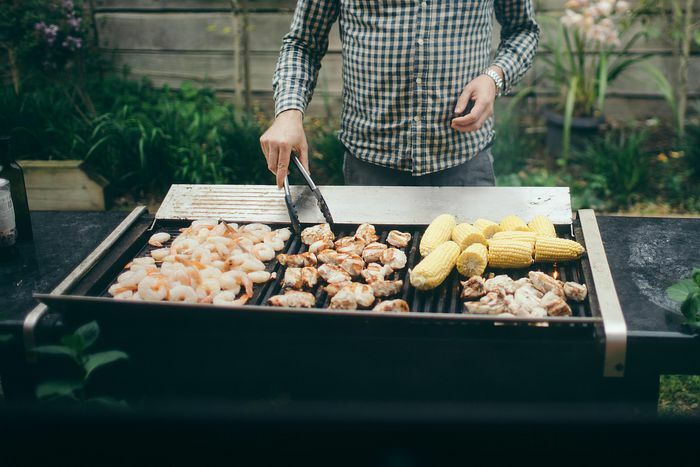 There are shortcuts to cleaning a gas grill, but these are not always a good idea. Stainless Steel presents some special challenges to cleaning. Stainless steel will show every fingerprint, and low-quality stainless steel will rust and discolor over time.